This Balkan Sobranie pipe tobacco is a reintroduction of the legendary original recipe made famous by the House of Sobranie and now produced in the Esoterica Tobacciana factory. 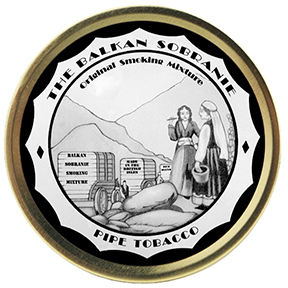 Blended and aged in the British Isles, Balkan Sobranie Original Smoking Mixture is comprised primarily of Latakia with a mixture of Orientals, Virginias, and other fine tobaccos. A bold, earthy blend with notes of spice and a mild sweetness, the "new" Balkan Sobranie Original Smoking Mixture has captured the attention of pipe smokers around the world.